Every car enthusiast loves a Jaguar. For more than six decades, the British brand has been setting the standard for elegance and refinement in motoring, but they could gain a new, unexpected virtue with the upcoming XE compact model: stellar fuel economy. It comes from a new high tech Ingenum engine family, with a lot of smart engineering to reduce weight all around, using aluminum everywhere possible towards that goal. 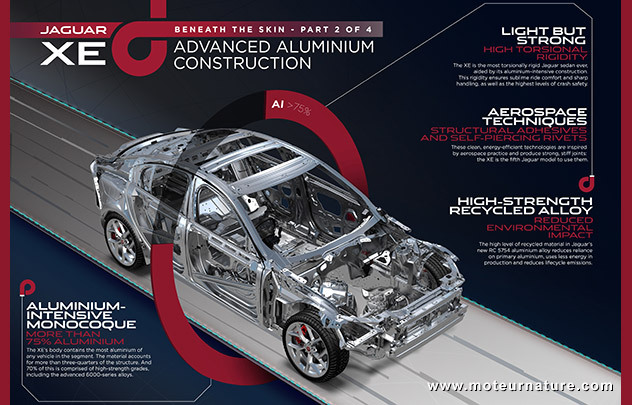 The use of aluminum in cars is hardly new. Jaguar has been building cars with it since the 1950’s but it’s the first time someone uses this metal in this segment. The forthcoming Jaguar XE will compete against the BMW 3-Series, and it should be lighter than all the competition with as much as 75% of its structure made of aluminum. Next are the high tech Ingenum engines. The engine, then. The talent of Jaguar’s motorists is well-known. Their V8 is among the best in the market, like the inline sixes in their time. They’re launching a new engine family, called Ingenum. It’s starting with an inline four, but there could be a straight six or (shocking!) a three later. The base here is a 500 cc cylinder size (just like BMW). 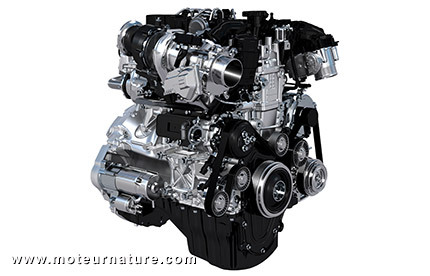 Ingenum engines will be gas or diesel, with the first one a diesel, code-named AJ200D. Stop & Start will be standard, just like turbocharging (single or double), direct injection and fully variable valve-timing. Ingenum engines will replace several actual Jaguar engines, with the best an incredible 80 kg lighter than the one it replaces. That’s progress! The Jaguar XE will be revealed privately next month in London, before the official world premiere at the Paris motor show in October. The best one should be rated at 75 mpg!